Have your next deposition at the TO&A Anaheim Court Reporting Suites, located in the beautiful new Courtyard Marriott Anaheim Hotel, just four blocks from the magic at Disneyland, and walking distance from the Anaheim Convention Center. We offer two flexible and fully furnished deposition/conference and board rooms, with seating up to 50. Our own TO&A professional litigation staff will be on hand to meet your every court reporting need. 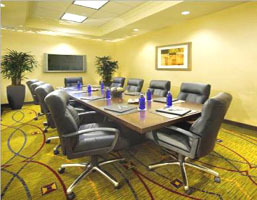 Our advanced audiovisual technology includes high speed internet, LCD projectors, and video conferencing. Interpreting services are also available. On-site restaurants include excellent Italian food and Ruth’s Chris Steak House.